A multi-room sound system (or multi-zone audio system), as its name states, distributes music in several zones, inside and outside of your home. An independent volume control in each zone. An independent control of the music source for each zone. A traditional multi-zone audio system is centralized and wired. That is to say all audio equipment is located in a centralized location like a closet or the basement, where wiring connects the equipment to the speakers and to the control pads in each room or zone. Wireless technologies have evolved to a point where it is now possible to transmit high quality music, with no distortion or clipping, while avoiding expensive wiring installation. A few well known brands now offer wireless music solutions, but not all offer the features of a multi-room sound system. 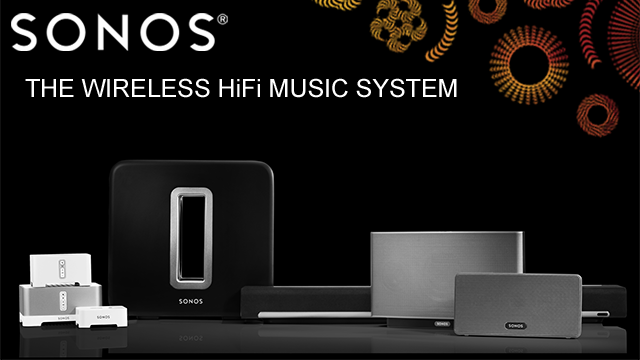 SONOS currently leads the market in the high end wireless multi-zone audio systems category. SONOS is known for its sound quality, ease of installation and use, and its connectivity with an impressive array of musical sources. That is why we recommend it to most of our clients.